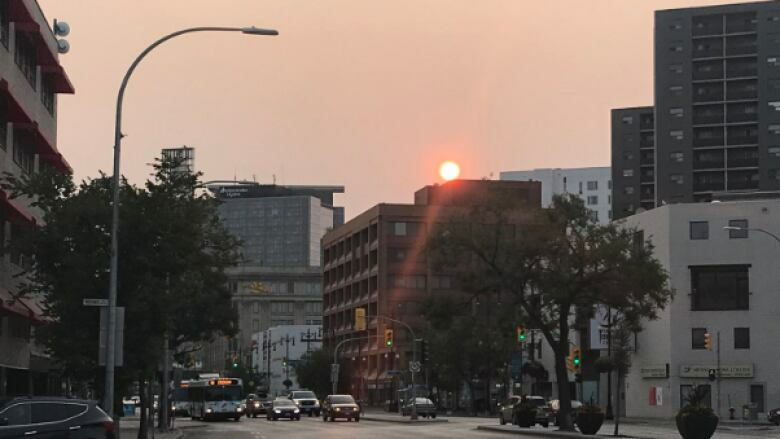 Manitoba has issued a heat advisory for the province and Environment Canada has issued an air quality warning in southern Manitoba as smoke from forest fires in Alberta and British Columbia hangs over the province. With much of the province expected to reach temperatures above 30 C over the next few days, the Manitoba government has issued an extended heat advisory for the province. The warning from Manitoba Health, Seniors and Active Living reminds people to take precautions against heat-related illness. Complete or partial loss of consciousness. Drink plenty of liquids, especially water, before feeling thirsty. Wear loose-fitting clothing, light-coloured clothing and a wide-brimmed hat. Plan outdoor activities during cooler times of the day. Go to a cool place, such as a mall, community centre, public library or place of worship. Compounding matters, the advisory also says people could experience diminished air quality, due to smoke from forest fires burning in Alberta and British Columbia. Earlier in the day Wednesday, Environment Canada issued an air quality warning in southern Manitoba as smoke from the fires in Alberta and B.C. hangs over the province. The weather agency said the smoke would gradually dissipate throughout the day. Until then, children, seniors and people with lung diseases are most at risk of increased coughing, throat irritation, headaches or shortness of breath as a result of the poor air quality. In these conditions, even healthy individuals may experience sore eyes, tears, coughing and a runny nose. Manitobans are encouraged to limit their time outside if breathing becomes difficult and turn off furnaces and air-conditioning units that may draw smoke indoors. People with health questions or concerns can contact their health-care provider or call Health Links at 204-788-8200 or toll free at 1-888-315-9257.